After the fall of the Taliban regime in 2001, Afghanistan was the center of attention of the whole world. With the financial, political and military support of the International community, Afghanistan gradually started to work on its economic, security and democratic foundations. It has an elected government and has developed diplomatic relations with countries around the world. Relationship with its neighbor Pakistan, with which it shares 2640 kilometer long border, is considered one of the most important. However, this relationship has always been rocky. The Taliban that operate and plan strikes from within Pakistan on the Afghan soil remain the biggest problem for Afghanistan and the International forces in that country. Afghanistan, the United States and many other countries of the world have been critical of Pakistan regarding this issue. “The Taliban-led insurgency and its al-Qaida affiliates still operate from sanctuaries in Pakistan,” says a U.S. Defense department 2012 report on Progress toward Security and Stability in Afghanistan. With its own sluggish economic conditions, Pakistan needs to look deeper into options for solutions to the security problems regarding its bordering areas and Afghanistan that can bring the much needed economic prosperity to the region. The atomic power Pakistan has been facing some serious challenges economically. The country’s economy has been sluggish for the past few years. The GDP growth is projected to be about 4 percent during 2014-2015 which is slower than that of its “regional peers” according to the World Bank’s Global Economic Prospects 2013 report. “FDI to Pakistan has continued to decline over a longer period (since 2008) reflecting the uncertain security situation, weak growth prospects, and widespread electricity shortages,” the report adds. The World Economic Forum’s The Global Competitiveness Report 2012-2013 ranked Pakistan the bottom 21st country out of a list of 144. To heal its economic wounds, Pakistan needs to look no further than its neighbor Afghanistan that presents a handful of financial and investing opportunities. Afghanistan is no longer a country of 90s which was abandoned by the United States after the defeat of the Soviet Union. More than a dozen of countries have poured in billions of dollars in Afghanistan’s education, infrastructure, financial and other sectors to a greater extent. To do the same and be a beneficiary of Post-Taliban Afghanistan, Pakistan may need to give up the strategic depth policy and look outside the box for trade ties with Afghans. By helping to end the Afghan insurgency, Pakistan can bring valuable improvements to its own economy. The TAPI gas pipeline, which will run from Turkmenistan through Afghanistan to Pakistan and India, can help bring industrial and economic progress in the neighboring countries. The gas sale purchase agreement (GSPA) has been signed for the TAPI gas pipeline that was discussed for years. According to The Express Tribune, The United States had offered to fund part of the project through the Export-Import Bank (EIB) and the Overseas Private Investment Corporation (OPIC) but this opportunity was wasted when Pakistan decided to boycott the Bonn Conference., “The TAPI pipeline will have a capacity to carry 90 million metric standard cubic metres a day (mmscmd) of gas for a 30-year period and is likely to become operational by 2018,” says a report of The Hindu. In November of 2011, Afghanistan signed a contract with India for the country’s largest iron deposit Hajigak which lies 100 kilometers west of Kabul. The estimated amount of ore is said to be 1.8 billion metric tons and is the biggest mining project in Afghanistan, according to a Bloomberg report. However, during the same week, Pakistan boycotted Bonn conference which was considered imperative for Afghanistan’s future and peace in the region. Protesting NATO’s airstrikes that killed 24 Pakistani soldiers, Islamabad, in a decision based more on emotions than shrewdness, also blocked supply route for NATO forces in Afghanistan. Pakistan created more doubts about its intentions towards the stability of Afghanistan that its politicians have repeatedly wished. In efforts to look for positive engagement, Kabul and Islamabad have signed many transit trade agreements (APTTA) with each other but the later has not been able to keep up to it and thus the otherwise profitable commerce accords have proved less productive. The latest agreement was signed in October of 2012 which will allow Afghan traders to take their goods to India through Gwadar port of Pakistan. 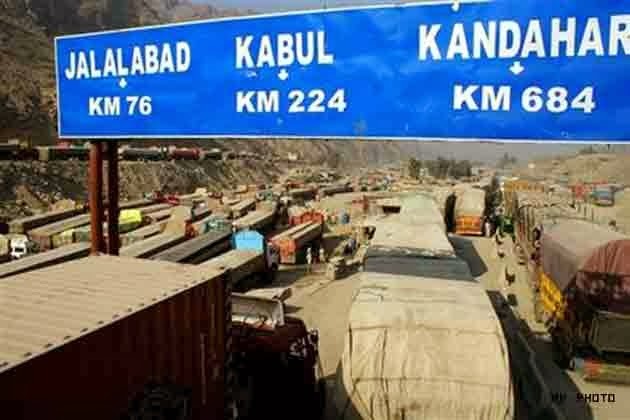 Pajhwok Afghan News reported, “During the sixth round of APTTA talks, Pakistan rejected an Afghan proposal to allow transit facility for the transportation of Indian goods to Afghanistan through the Wagha border.” But many fear that Pakistan may not remain persistent in implementation of the new agreement. The rail track that is being planned to connect Afghanistan to its neighbors will prove to be a great step towards increasing trade between the neighboring countries. One of the tracks is being constructed to connect Pakistan and Afghanistan with “shared project cost”. “The rail tracks would link Baluchistan's capital of Quetta to southern Kandahar province and Peshawar to Jalalabad,” Pajhwok Afghan News reported. This would provide an opportunity for a boost in bilateral trade and open door for Pakistan to Central Asia through Afghanistan. With its own sluggish economic conditions, Pakistan needs to look deeper into options for solutions to the security problems regarding its bordering areas and Afghanistan that can bring the much needed economic prosperity to the region. Pakistan knows better than anyone else how to deal with insurgents and by bringing Taliban groups including the Haqqani Network to peace talks, it could play a major role to help end the Afghan war. “Elements within the Pakistani security establishment continue to view the Haqqani network as a useful ally and proxy force to represent their interests in Afghanistan,” says Institute for the Study of War, 2010 report. Afghan officials and the public have now and then expressed their doubts about Pakistan’s desire for stability in Afghanistan. It is Islamabad’s best chance to prove everyone wrong and demonstrate its sincerity by pressuring the involved armed groups to reach a peace deal in Afghanistan. To be considered a trusted partner in war against terror, Islamabad has to play smart by switching its focus from helping and funding terrorist activities to investing in the reconstruction of Afghanistan and building a friendly relationship with its neighbor. This will not only help the Afghan economy but also the Pakistani. It’s time for Islamabad to discontinue whining about India’s influence in Afghanistan and instead bring fundamental changes in its foreign policy that would mean increased trade and economic ties with Kabul and thus political and economic development for its own nation.